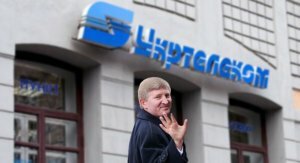 PJSC Ukrtelecom whose 92.79% stake belongs to LLC ESU, which is controlled by Rinat Akhmetov’s System Capital Management (SCM), will not pay dividends for 2017. “It was decided that the profit the company generated last year will be used to cover losses accumulated over previous periods,” Ukrtelecom’s press service told Interfax-Ukraine. In addition, shareholders re-elected the supervisory board together with its head, Leonid Netudykhata, who once headed the State Service for Special Communications and Information Protection, was Deputy Minister of Transport and Communications, and worked as Chairman of Ukrtelecom’s Board of Directors in 1997-2000. “The shareholders confirmed the top managers’ course towards further modernization of the company and an increase in the share of revenue from new IP services,” the press service said. As reported, PJSC Ukrtelecom completed 2017 with a net profit of UAH 867 million, which was 44.3% more than in 2016. The operator’s net income over the year increased by 1.7%, to UAH 6.654 billion. Earnings before interest, tax, depreciation and amortization (EBITDA) grew by 4.9%, to UAH 1.867 million, EBITDA margin rose by 1.8 percentage points, to 28.1%. The company’s capital investment decreased by 0.7%, to UAH 948 million.